Create React Native App: Get a Native App Started Fast — Much as Create React App makes it very easy to start work on a new React app, Facebook now has an alternative for React Native apps. Does React Have A 'setState' Problem? — A comment by Eric Elliott sparked a discussion about the merits of setState. React Conf 2017: The Full Recorded Stream — Want the full unedited React Conf experience? Things start at 21 minutes in and run the full 8 hours. Day 2 here. 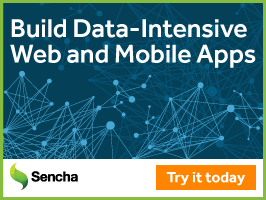 Create data-intensive, feature-rich web and mobile apps with Sencha Ext JS — Learn how to design, develop and test data-intensive web apps that run on desktops, tablets, and smartphones with Sencha Ext JS. A Cartoon Intro to Fiber — Fiber is an ongoing reimplementation of React’s core algorithm and if you want to understand it from the ground up, Lin Clark does a great job in 30 minutes. Introducing React Loadable: An Elegant Way to Load Components — We linked to the project last week but here’s a more in-depth explanation. New Course: Complete Intro to React w/Router v4, Redux & more — Much more than an intro, build an entire real-world web application in layers with Brian Holt (Netflix) using React and library ecosystem like Router v4, Redux & Jest. react-sourcerer: A Linting Framework Built in React — A quick 5 minute look at an interesting alternative use for the React approach. GitHub repo. Sketch: A React Native Live UI Development Tool — Think Codepen or JSFiddle but for React Native development. It uses Expo under the hood. react-perimeter: Create An Invisible Perimeter Around An Element — … and respond when it’s breached. redux-idle-monitor: Schedule Events During User Idle Times — Invoke events at various levels of idleness during a user’s session, even across tabs. React Router v4 Released: Declarative Routing for React — The final release is now out.